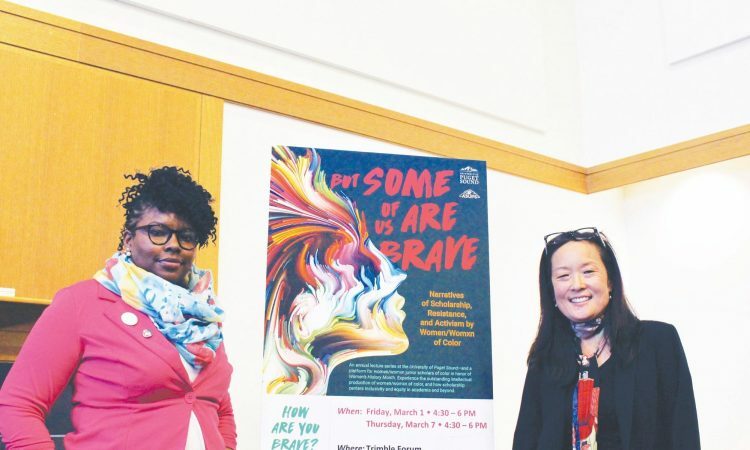 In the annual “But Some of Us are Brave” lecture series, guest speakers Nana Osei-Kofi and Stephanie Han confronted the under-discussed topic of multiraciality and polyculturalism to an excited crowd of students and community members. The series was co-sponsored by the Coalition for Multiracial and Biracial Students (COMBS), a club working to bring awareness to the experience of multiracial people on the Puget Sound campus. Osei-Kofi and Han presented on March 1 and 7, respectively, in Trimble forum. Osei-Kofi is a professor of women, gender & sexuality studies at Oregon State University and Han is an acclaimed writer and English scholar. The series was created in 2018 through the joint collaboration of Professors Brackett of the African American Studies Department and Dr. Sarah West of the Hispanic Studies Department. The goal of the series was to feature women of color in higher academia, and invite Puget Sound students and community members to engage with the research and activism of these acclaimed scholars. Additionally, the series works to highlight women scholars whose work continues to further the inclusivity and equity of women of color in academic settings. “I wanted to reach across different cultures and backgrounds,” Dr. Brackett said. As Dr. West’s appointment last year as Visiting Instructor of Hispanic Studies came to a close, she was hired at the University of Illinois as a tenure track professor. This year, Dr. Brackett was the sole organizer of the “But Some of Us are Brave” series. “I was so happy to see that people in every department that I reached out to that had a little bit of money said, ‘Sure, we will give you what we can,’ which shows that they know … we need that voice,” Dr. Brackett said. In the first lecture of the series, Osei-Kofi shared her research and experience in a lecture titled “Notes on Multiraciality: Reflections on the Personal and the Political.”At the beginning of the lecture, COMBS founders Isaiah Thomas and Lenora Yee spoke to the importance of COMBS as a club that recognizes the experience of multiracial people. “We don’t get a lot of spaces to talk about this,” Thomas said. COMBS was created after Yee and Thomas met in an affinity group at the Posse scholarship retreat. Since the club was created, weekly meetings have begun. “Every week we talk about an issue that we face in daily life, back at home or on campus. We are trying to create a welcoming community for multiracial students on campus,” Thomas said. Osei-Kofi’s lecture combined a personal speech with an audience discussion. Osei-Kofi shared that the lecture was meant to encourage conversation between everyone in attendance. As a result she often stopped her lecture to ask for audience participation. “When I introduce it, I always try to make sure people know that this is for the students and the reason I enjoy doing it … is when I see students interact … they’re laughing and enjoying, and they’re connecting and they’re collaborating, and they’re excited,” Dr. Brackett said. She worked with Osei-Kofi, Han and COMBS to create a lecture series that would encourage active audience participation. Osei-Kofi’sexperience as a biracial woman of Swedish and Ghanaian heritage has greatly influenced her work. In her lecture, she spoke on her personal experiences growing up in Africa and Sweden as a biracial woman. “As a child when I moved to Ghana they would call me ‘oburoni’ … which means white person or foreigner,” Osei-Kofi said. In Ghana, Osei-Kofi wasn’t recognized for her Ghanaian heritage because of her multiraciality. When she moved to Sweden four years later, she faced a similar type of bullying as she was not recognized for her Swedish heritage. In the lecture and discussion, a recurring point of conversation was the unique struggle that multiracial individuals face as they are cannot fit into the society’s unfortunate and limited expectations of race. These expectations are particularly unrealistic for multiracial individuals, whose multi-faceted existence cannot be constricted to a single representation. The second event of the series focused on the writings of Stephanie Han, acclaimed author of “Swimming in Hong Kong,” a short story collection that narrates the stories of various Asian women across Hong Kong, Korea and the United States. Han kicked off the event with a short story from her book, followed by a lecture on what it means to be polycultural, especially in a globalized world, as a woman of color. Han specifically stressed the power of stories, and the function that narratives hold within our society. Utilizing themes present in her own writing and narrative, Han transitioned within her lecture toward addressing the qualities of a polycultural society, specifically acknowledging its relevance in a global context. Although Han acknowledged there are problems present within the Hawaiian community, of which she did not go into great detail, she ultimately believes it stands as an example of what polyculturalism looks like on a smaller scale. “I liked the nuance with which Stephanie Han dealt with polyculturalism, specifically looking at Hawaiian identities as a pinnacle for polyculturalism,” senior Arcelia Salado Alvarado said. After the lecture, the audience was encouraged to ask Han questions. Topics such as global oppression were highlighted as well as the ways in which the individual interacts in a global society. This included comments from Han regarding the need to address one’s own participation in the exploitation of others within the global market, such as wearing clothes produced by child laborers in foreign countries. “She was very eloquent and straight-forward with her answers. … Polyculturalism is happening. … It is inevitable but while we are going through this we have to be cognizant of the power structures and the oppression that can be caused by the systems in place,” ASUPS President-elect Mushawn Knowles said. Just like the first lecture with Osei-Kofi, after the event, there was a dinner held with Han and students and faculty from the University of Puget Sound, which drew to a close the second, and last, visiting lecturer event of this year’s “But Some of Us are Brave” series. The series concluded with a Womxn of Color Community Circle on Thursday, March 14, which gave students and faculty who identity as womxn of color the opportunity to speak about their personal experiences and narratives. “I believe that this space, which is a temporary quick space, allows for people to be a little more brave about what they really want to discuss,” Dr. Brackett said.